September | 2013 | Pray for Revival! Islam looks down on homosexuality just as much as Christians do, but I’ve yet to hear of any Muslim chaplains getting in the same troubles as Christian chaplains. One of the most wonderful mysteries in the universe is that prayer changes things. God has so arranged his world that we have the ability to make significant choices, some good and some bad, which affect the course of history. One means God has given us to do this is prayer—asking him to act. Because he is all-wise and all-powerful, knowing “the end from the beginning” (Isa. 46:10), he’s able to weave our requests into his eternally good purposes. At this point our thinking can seriously go astray in one of two directions. Here there’s an overemphasis on God’s absolute sovereignty. Here the emphasis rests on a certain understanding of human freedom (“libertarian”). Taken at face value, both objections appear to have some force, but only because they employ a strange “logic” that goes beyond Scripture. It’s always foolish and dangerous to play up one aspect of what the Bible teaches at the expense of something else it equally affirms. The God of the Bible is presented as the one who rules over all; he’s all-knowing, all-wise, and all-powerful. He isn’t surprised by anything we may think or do. On the other hand, Scripture also presents human beings as responsible moral agents who make significant choices, doing what we desire to do (“freedom of inclination”). God has chosen to relate to us personally without compromising the fact that he is God. That said, Scripture describes the sovereign God as “repenting” or “relenting” in response to human prayer. Take Exodus 32, for instance. At this point in salvation history, the people of Israel have broken the Ten Commandments by building and worshiping a golden calf. Incensed, God vows to wipe them out. “I have seen these people, and they are a stiff-necked people,” he says to Moses. “Now leave me alone so that my anger may burn against them that I may destroy them. Then I will make you into a great nation” (vv. 9-10). But Moses steps into the breach and reminds God of his promises, arguing his reputation will be brought into disrepute for saying one thing—”I will save the people”—and doing another—destroying them, appearing to renege on his promises to Abraham. Moses appeals to God as the sovereign king to show mercy (vv. 11-13). And that’s exactly what happens: “Then the LORD relented and did not bring on his people the disaster he had threatened” (v. 14). Can we believe that God really modifies his action in response to the suggestions of men? For infinite wisdom does not need telling what is best, and infinite goodness needs no urging to do it. But neither does God need any of those things that are done by finite agents, whether living or inanimate. He could, if he chose, repair our bodies miraculously without food; or give us food without the aid of farmers, bakers, and butchers; or knowledge without the aid of learned men; or convert the heathen without missionaries. Instead he allows soils and weather and animals and the muscles, minds, and wills of men to co-operate in the execution of his will. “God,” said Pascal, “instituted prayer in order to lend to his creatures the dignity of causality.” But not only prayer; whenever we act at all he lends us that dignity. It is not really stranger, nor less strange, that my prayers should affect the course of events than that my other actions should do so. They have not advised or changed God’s mind—that is, his overall purpose. But that purpose will be realized in different ways according to the actions, including prayers, of his creatures. Our problem in trying to see how prayer “works” is that we often have a wrong view of God in relation to his world. Often we think of God like Bruce Almighty, sitting in a celestial office and feverishly dealing with all the requests that arrive: “Mrs. Green prays her husband’s cancer be cured,” “Mr. Young prays his wife might conquer alcoholism,” and so on—with a million more worthy requests. It’s seems to be in line with God’s will that Mr. Green be healthy and Mrs. Young be sober. But what if both get worse? Does this mean that God doesn’t answer prayer? The tangled web of humans living in a fallen world makes things more complex. At times, the good ends God desires arise from certain evils. So at one level, cancer is an evil, part of the curse on a rebellious world. God sometimes does answer prayers for healing (and in one sense all healing is divine in that God is working providentially). But we also must recognize that since we’re mortal, all people die sometime. What’s more, other prayers may be offered and answered that can only be answered if there’s not healing—like gaining patience through suffering or an increased focus on the world to come. Maybe Mr. Green’s son has turned his back on God, and through his father’s illness he’ll return. So in order to “answer” one prayer, the return of the son, God doesn’t “answer” the other, complete healing. God alone knows what is best. UPDATE: Henry has been found! Yesterday’s tragic shooting at the Navy Yard in Washington D.C. was yet another reminder of the fragility of life. Unfortunately this horrific occurrence, like others before it, could possibly have been avoided. This morning, we learned of the shooter’s struggles with mental illness. Tonight, Rick Warren goes on CNN to discuss the reality of mental illness and how Christians should respond. As you might recall, Rick’s son took his own life this past spring after struggling with mental illness for some time. Matthew’s life was not a waste and, yes, every day had a purpose. His pain is over now, but perhaps his life and death will remind us all of the reality of mental illness and inspire people of faith to greater awareness and action. The fact is, mental illness is real. And it’s a real illness. I wish more Christians saw that. 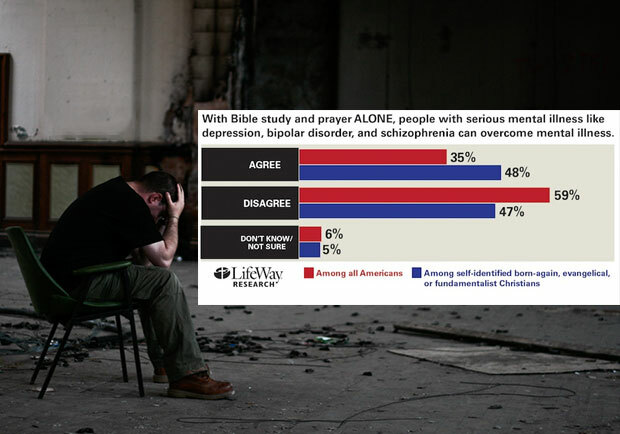 So LifeWay Research is taking the initiative to help others realize this as we prepare kick off a major research project on how the church can best minister to persons with mental illness. I’ll share more on that study at a later time. However, this morning we released some new research on mental illness, suicide, and more. CNN even cited it in their promotion of tonight’s interview with Rick Warren.